This section contains a table showing the number of times ozone concentrations in the Bay Area historically exceeded air quality standards. The Spare the Air Program began in 1991. The table below lists the number of Spare the Air advisories issued for the Bay Area each year since then, as well as the number of days on which ozone concentrations exceeded the state and federal health-based air quality standards. 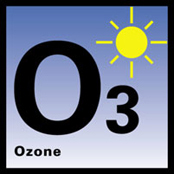 * The national 1-hour ozone standard was revoked on June 15, 2005. ** The national 8-hour ozone standard of 0.08 ppm was not implemented prior to 1998. On May 27, 2008, the U.S. EPA implemented a more stringent national 8-hour ozone standard of 0.075 ppm. In December 2015, the U.S. EPA implemented an even more stringent national 8-hour ozone standard of 0.070 ppm. *** The California 8-hour ozone standard became effective May 17, 2006. The Air District began keeping records for the standard in 2005. **** On three exceedance days in 2008, four of the six exceedance days in 2017, and all three exceedance days in 2018, ozone concentrations were exacerbated due to wildfire emissions. This does not necessarily mean that these ozone exceedances were solely caused by wildfire emissions. Spare the Air alerts are issued when violations of national health standards are predicted by the Air District during the Spare the Air season. The national 1-hour air quality standard for ozone was set at 120 parts per billion in the ambient air, averaged over 1 hour. The U.S. EPA revoked this standard as of June 15, 2005. The national 8-hour standard for ozone is set at 70 parts per billion of ozone in the ambient air, averaged over 8 hours. The California 1-hour standard for ozone is set at 90 parts per billion of ozone in the ambient air, averaged over 1 hour. The California 8-hour standard for ozone is set at 70.0 parts per billion of ozone in the ambient air, averaged over 8 hours. Visit the Air District's web site for more information about the state and federal ambient air quality standards and the Bay Area's attainment status, and to see ten years of annual air quality summary information about Bay Area air quality.